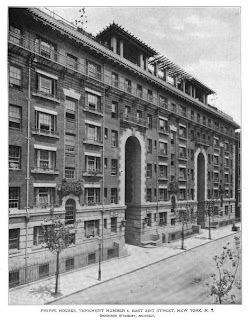 The Phipps Houses, a six-story tenement building built for Henry Phipps and designed by Grosvenor Atterbury c. 1906 at 321-337 East 31st Street in New York City. 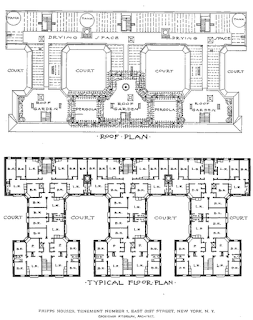 Phipps created a $1 million fund for the creation of his model tenements which were designed to prove that one could earn a return on this new, larger form of tenement design while providing more suitable living standards. Click HERE for Christopher Gray's Streetscapes article on the Phipps Houses and HERE for a 1905 NYTimes article on the announcement of the creation of the Phipps tenement fund. 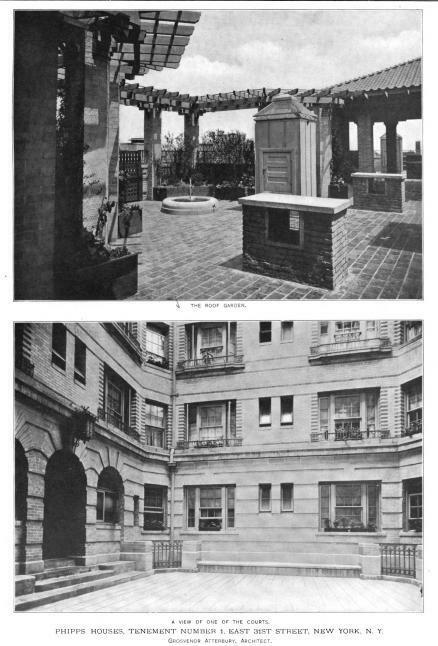 Click HERE for more on Phipps Houses and their affiliate Phipps CDC. The building has since been demolished. It is interesting that the apartments have a room designated with a 'P' which I presume is for 'Pantry'. 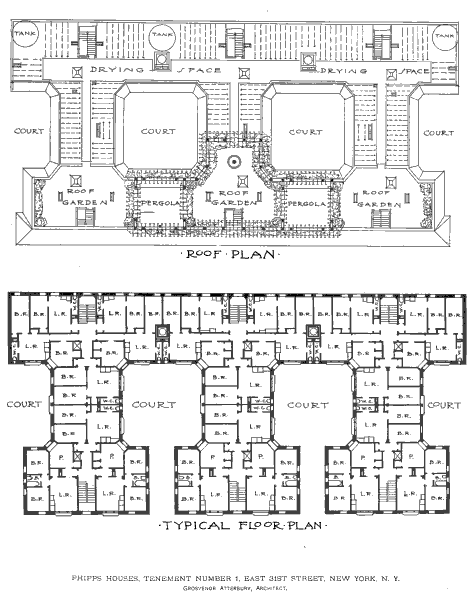 Was there a communal Kitchen and Dining Room on the Ground Floor? I think it was a Parlor. I saw no kitchen so maybe it was a pantry. I believe the kitchens were in the living rooms much like in the show The Honeymooners. I think that's what the boxes are in the corners of each one.